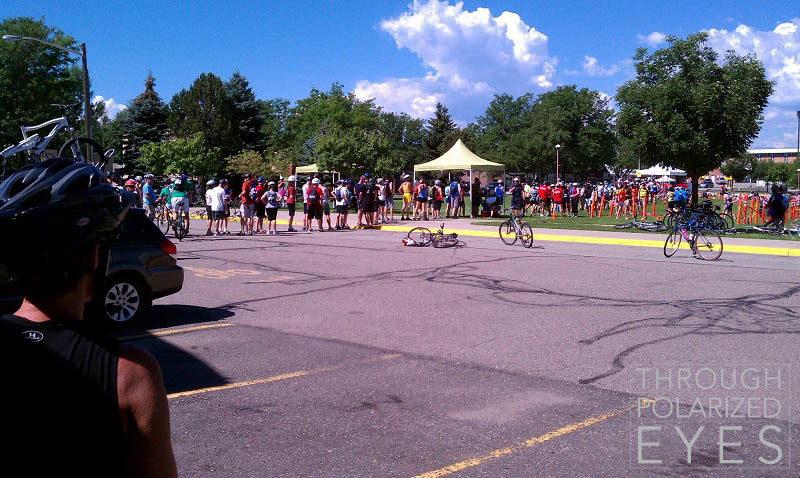 If I had to choose one word to describe this year’s New Belgium Urban Assault Ride in Denver, it would be “junkshow.” If I had to choose two, “frat party.” This was not my first UAR, but was most likely my last. The day started off well enough. Though limited in number, the porta-potties were sufficient and there were no major lines. There was lots of water available for people to fill up with (important, since it was approaching 80F for the start at 9am). Everything went to hell at about 9:01am. The first mystery location – which all participants had to get to in order to find out the second mystery location, and thus plan the rest of their route for the day – was about five blocks from the start. This was a complete disaster, as every single participant swarmed there at the same time. I’d say at least 80% barreled the wrong way down multiple one-way streets to get there, which doesn’t exactly endear cyclists to the hearts and minds of the general public. Fighting through the crowd to get a bead took several minutes, which was followed by…fighting through the crowd to get to the clue for the second mystery location. The clue was a small photograph, placed on the ground. Pro-tip #1 for the Race Director: a large print that could’ve been hung on the wall or from a rafter can be printed at Kinkos for a few dollars. Pro-tip #2 for the RD: don’t put the obvious first stop five blocks from the start. After seeing the clue (a portion of the mural on the wall of Salvagetti Bicycle Workshop – an awesome LBS and a clue that took anyone even remotely involved in the Denver cycling “scene” about half a second to recognize – though most were seen pulling out their phones to take photos to send to someone else to figure out what it was) I – wait for it – fought through the crowd one more time and was off. The checkpoints seemed to fly by, and in retrospect, the entire course seemed shorter than before. All said and done it was about 20 miles; previous years seemed closer to 30. There was yet another mistake in route planning – the farthest point (which, for some reason, was a double checkpoint) was about equally as far away in the (non-official-yet-obvious) loop regardless of which direction you took, and everyone hit it at the same time. This resulted in a 10+ minute wait. Pro-tip #3 for the RD: don’t do this, especially with a checkpoint that can only handle a relatively small number of people at one time. The obstacle in question? The big-wheel trike course that has always been at the finish. I did manage to pull off a powerslide so rad that one of the volunteers exclaimed a “NICE!” as I slid by, which was awesome. If only I could’ve combined the powerslide with a high five! The finish was incredibly uneventful, in stark contrast to prior years (which had the big-wheel course at the end, where it should be). After checking in for our time and throwing a lock on the bike, it was time for the party. I crossed 16th St. Mall, got my two comped beer tokens, and immediately felt like I’d walked in to a frat party. The music sounded like the soundtrack from a LoDo bar at midnight on a Saturday night, complete with a lame DJ putting in random scratches and skips. Shirtless brolies were so numerous they were effectively uncountable. It’s a shame that such a great event has gone so far downhill so quickly. Poor course layout, boring checkpoints, and a completely different vibe than is normally found at a New Belgium event (this is the first junkshow frat party of the eight NB events I’ve participated in, and hopefully the last – NB can put on a great event) has me completely uninterested in coming back next year. The brolies can have it. It looks as if the events in 2011 have gotten too big. As I look at the Minneapolis ride tomorrow morning, the check points are repeats. Less interesting overall. But i’m hoping for a good time anyway.